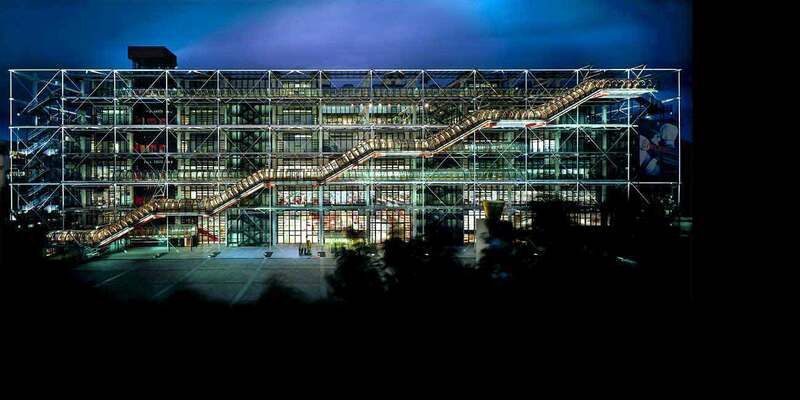 The Centre National d’Art et de Culture Georges Pompidou is a giant, futuristic arts center located in the Beaubourg district of Paris. 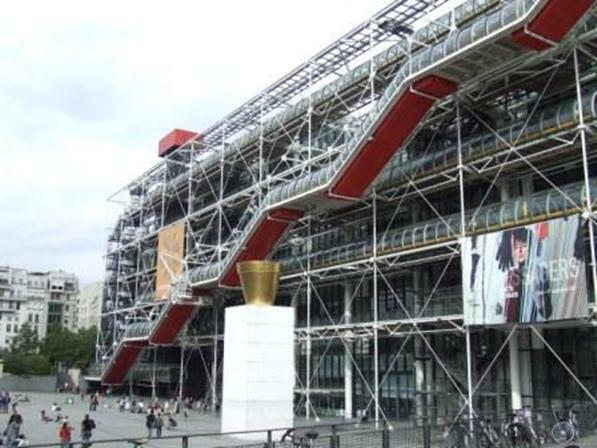 President Pompidou conceived (1969) the idea for Beaubourg, as the center is also known, to bring art and culture to the “man in the street”. 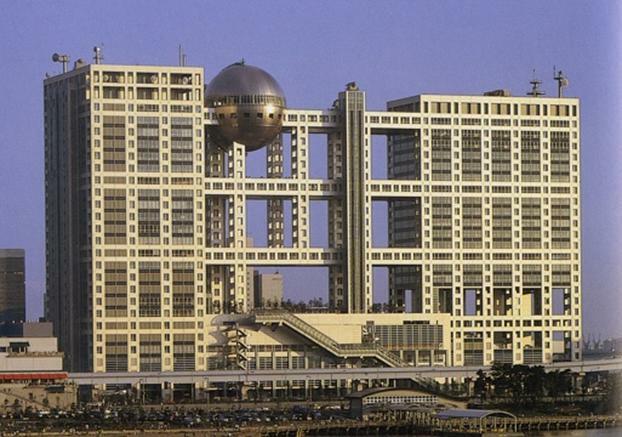 It was completed in 1978 by the architects Renzo Piano of Italy and Richard Rogers of England, and by the engineering firm of Ove Arup and Partners of England. The structure forms a huge transparent box whose exposed frame of tubular steel columns carries trusses spanning the width of the building. External mechanical systems -- elevators painted red; escalators in clear plastic tunnels; and giant tubes for air (painted blue), water (green), and electricity (yellow) -- all are conspicuously placed outside the main columns. Considerable controversy arose over the assertive industrial style of the Pompidou Center, whose bold “exo-skeletal” architecture contrasts violently with surrounding houses in the heart of an old section of Paris near the Hôtel de Ville. The Center has been hugely successful, however, with its many art exhibitions and the National Museum of Modern Art, attracting more than 160 million people since its inauguration. The wear and tear resulting from some 26,000 daily visitors -- five times more than intended -- caused most of the facility to be shut down for renovations, to be re-opened at the end of 1999. Meanwhile, the library, Bibliothèque Publique Information, is housed in temporary quarters for the interim. Part of the building will be kept open for temporary exhibitions, and you can still take the escalators to the top floor for a marvelous view of Paris. The Beaubourg Plaza in front of the Centre remains a very animated area: its jugglers, mimes and humorists from all over Europe continuously attract a crowd. This Paris tradition, which survives from the Middle Ages, can also be spotted in other areas like Saint-Germain-des-Près and the Place de la Contrescarpe (near the Panthéon). The Beaubourg area is especially lively at night, offering visitors plenty of bars and restaurants. Submitted by Duchamp under the pseudonym Richard Mutt (of Philadelphia) for the first exhibition of independents in 1917—for which he was a hanging committee member—the original was somehow forgotten, misplaced and then apparently lost for good. Duchamp shortly afterwards resigned from the committee (the reason is not recorded). The Society of Independent Artists, it is worth recalling, was resolutely democratic: “Any artist, whether a citizen of the united States or of any foreign country, may become a member of the society upon filing an application therefore, paying the initiation fee (US$1.00) and the annual dues (US$5.00) of a member, and exhibiting at the exhibition in the year that he joins.” The society’s only rule was the no rule principle: “No jury, no prizes.” All artists were to be able to participate independently of any jury decisions. Accordingly, 2,125 works by 1,235 artists were shown. As far as I am aware none of these exhibits are currently available for viewing. The only submission on record that failed to be exhibited was R. Mutt’s Fountain, and images and reproductions of this work are ubiquitous. Removed from its own contemporary, it seems, Fountain was nonetheless to go on to become one of the most celebrated and influential artworks of the last century, and its stature is growing with time. Its anti-retinal principle, that of the readymade, adds a further resource to the artist’s repertoire, that of choosing instead of simply making. In this way the readymade looks not only forward to when the assisted or unassisted readymade—the found object, altered or even reproduced in facsimile—would become a staple of art training but it also looks back in recognition and belated acknowledgement that art was always about choice of readymade, given that the paint used on painting was itself a form of readymade. The inclusion of a title as no less a part of the work—a technique that Duchamp had pioneered in 1911—allows it to speak as if it was an actor, playing another role: the urinal is acting being a fountain, the exhibition its stage, the artist a kind of dramatist or choreographer. It’s possible to argue that Duchamp’s way with the artwork is actually very old—he was rebelling against romanticism in art that was current amongst artists for, in my calculations, only about 30 years, from 1814 to 1844—replacing that with the idea that art should be an apparatus of thought, rather than vision or beauty. If Mutt’s (or Duchamp’s) work is marked first of all by its vanishing from its present—majestically avoiding its own contemporary—then secondly it is marked by the variety of versions of it that increased exponentially in number after the 1950s. In order to be regarded as a version of Fountain an artwork would not necessarily need to resemble it. Although R Doxford/N Fout’s Soft Fountain (1973) does in its own Squashy way resemble the absent original, it repeats more exactly the wit of its model, extending its idea through a replication that must be distinguished from more common notions of repetition thanks to the addition of its material difference [Figure 5]. The same—although, again and crucially, in a quite different sense—can be said of Andy Warhol’s Campbell’s Soup [Figure 6]. Carl Andre’s brilliant Equivalent VIII (known thanks to its delayed notoriety as “The Tate Bricks”) performs a similar kind of work [Figure 7]. In each case the artwork avoids any kind of representation yet its material form always revises or replicates an original by maintaining a visibly absolute distance from it (in Warhol’s case by departing from it in no way at all and thus perfectly exemplifying the minimalist ideal). The public response to these works (which is always somehow belated) confirms their contemporariness (allowing a general ridiculing of “contemporary art”) while distancing them from their own contemporary. Equivalent VIII by Carl Andre was bought by Tate in 1972 and featured in special displays in 1974 and 1975 without attracting much publicity. But on 15 February 1976 an article appeared in The Sunday Times about recent additions to the Tate's Collection, illustrated with a picture of Equivalent VIII. The sculpture, 120 firebricks arranged in a rectangular formation provoked gleeful uproar [e.g., Figure 8]. The failure of a national media to comprehend a contemporary exhibition would be exactly the necessary sign that contemporary art has arrived. Baudrillard’s response to the Beaubourg, as it is called, argues that this government sponsored building designed to house modern art and make it accessible to the general populace (the masses as they are sometimes called) functions in fact to neutralize and domesticate the creative and political power of modern art itself. It contains it, renders it transparent, and in effect prevents it from developing any further. The artwork was always, in Baudrillard’s argument, marked by the surprise of its event, its unaccountability, and the ways in which it is capable of provoking thought and even reorganizing the spaces designed for its exhibition. The Beaubourg functions to render these forces redundant. They “implode” (the folding in of edges, the sucking inwards of breath or air) on themselves in this space, which he compares metaphorically with a black hole. The Beaubourg is a site, then, not of revolutionary modern art but of “involution” (making more complicated and endlessly self-referential). Baudrillard puts it another way: the Beaubourg is not simply a gallery; rather it is a supermarket—or hypermarket—of culture. Baudrillard’s style is interesting too. He has absorbed the vocabulary of the Centre Pompidou’s propaganda and turned it against itself.